Long-time followers of our site will be familiar with Nick Vasallo, but for any newcomers in the audience, he is the lead vocalist and songwriter for the excellent technical death metal band Oblivion — and he has a Ph.D. in Music, he is an assistant professor at Cal State Polytechnic University (Pomona), and he is a composer of contemporary classical music whose works have been performed internationally. When last we featured him in these pages (here), the subject was the composition that earned him his Ph.D., a unique collision of heavy metal and classical music entitled Black Swan Events. Now we’re delighted to bring you the on-line premiere of another composition that incorporates elements of both musical genres. The title of this new work is “Ozymandias”, and it comes in the form of a remarkable music video. Accompanying the video we also have a brief interview of Nick Vasallo in which he discusses the music and the way in which it has been presented in the video. As the name suggests, the music was inspired by Percy Bysshe Shelley’s famous poem “Ozymandias”, an allegory for the impermanence of empires, and at a deeper level, of most human achievements; perhaps only art survives, the poem suggests, and even then in a state of gradual decay. The music is an unpredictable work — sometimes dissonant, distorted, and disturbing, sometimes quite head-bangable, and sometimes dramatically powerful. And it ends with the sound of singing bowls! The music is performed by two Bay Area groups working together — the guitar-and-drum duo known as The Living Earth Show (Travis Andrews and Andrew Meyerson), and Friction Quartet (violinists Otis Harriel and Kevin Rogers; Taija Warbelow on viola; and cellist Doug Machiz). Emily Orum plays the singing bowls. 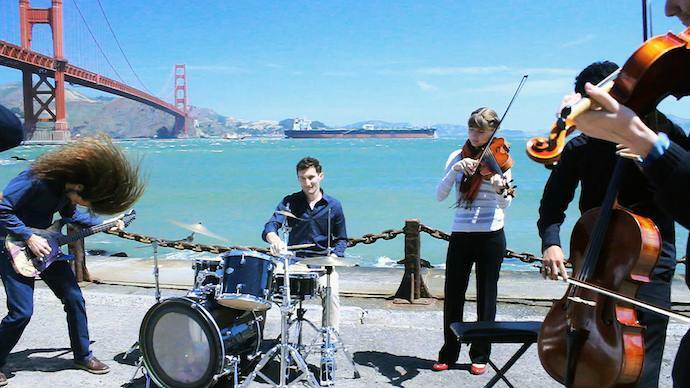 The video is a combination of footage of these two groups performing the composition outdoors near the shores of the San Francisco Bay (filmed by Taylor Joshua Rankin) and an award-winning 2012 short film named Elefante, written and directed by Pablo Larcuen. Vasallo saw thematic similarities between Shelley’s poem and Elefante, and although they may not be apparent at first blush, there’s no question that the story told in the film and the music fit together like hand and glove. We’re pretty sure you won’t hear or see anything like “Ozymandias” today, or any other day, and we’re damned glad we get to show it to you. After the video, we’ve got our short Q&A with Nick Vasallo — and Shelley’s poem. You’ve said that your composition was based on Shelley’s “Ozymandias”. Is the music an attempt to interpret or give life to the poem directly, or is the connection between the two more oblique? I may not be asking the question very well, but I’m interested in more elaboration about the creative process that produced the music. The piece is a tone poem based on “Ozymandias”. The structural decisions and drama will be delegated by my interpretation of the poem. Could you comment on the structure of the composition and the decisions you made to vary the tempo and the musical styles as the work unfolds? At times it’s very dissonant and disconcerting, at other times it’s a real head-banger, and at still other times it’s lush and beautiful. Friction Quartet functions as a single force, contrasting the electric guitar. I tried to show the beauty of distortion in this work, and mix some of my favorite metal genres in a concert work. Musically, the ideas I rely on are very limited. A harmonic cluster goes through changes, and is affected by another musical idea that blurs everything that comes into contact with it. The climax in the poem is the tutti just before 8 min.. a glorious moment when 2 harmonic worlds align, resulting in immense power. The video for the music is a fascinating union of Pablo Larcuen’s 2012 “Elefante” film and your composition. The film isn’t connected to the “Ozymandias” poem, yet it really seems to make a good fit with the music. What made you think of using it, or did the film also play a role in your inspiration for the music? I like metaphors and not so obvious symbolisms. To me, they are like Easter eggs that the enlightened will find. Music videos like Radiohead’s”Just” had a lasting effect on me as a teenager. I want to capture that beauty and mystery in a music video. So far “Ozymandias” is the only piece I’ve yet written that has potential for this kind of story. A while ago I saw a Spanish short called “Elefante” and fell in love with it. This was the same time I was obsessively reading “Ozymandias” and searching for the core for this piece. “Ozymandias,” to me, is about the loneliness of mankind; how societies all collapse and change (eventually). All that is left are the monuments that stand, aging and eventually forgotten. I had been trying to get a hold of Pablo Larcuen to use his film as the narrative of this music video. I explained to him the concept of my musical work and he granted me permission to use his film. His short is simple, yet emotional and absurd. Kind of like the the music for “Ozymandias.” His story is about a man who is unhappy and lonely. He turns into an elephant and his old life is dead and gone. What remains is the aging creature he has become. Has Pablo Larcuen seen the music video, and if so, what was his reaction? Not yet, I am excited to show him though. I was particularly moved by the dramatic swelling of the music at the point near the end of the film that takes place at the zoo. It almost seems as if that part of the composition was written for that moment in the film. I’m wondering how that penultimate passage connects to the poem. It is a moment of immense power. In the musical score I wrote this (and other) passages of the poem so the musicians knew where they were. I wasn’t familiar with The Living Earth Show or The Friction Quartet. Could you tell us a bit about them and how you came to choose them as the performers for the piece? The Living Earth Show – electric guitarist Travis Andrews and percussionist Andy Meyerson – besides being very cool guys are a truly unique contemporary chamber group. They have the ability to transcend genres and make it work for concert music. We’ve been fans and friends of each other for a little while now. I want to write them a doom album with distorted clarinet with my other friend Gleb Kanasevich (the internet sensation who does all the crazy tech-death clarinet covers). Friction is traveling the same path as TLES. They too are crossing other genres and doing their own thing. They are one of the finest young groups to emerge from the Bay Area (I need to give a shout out to Mobius Trio too). Doug the cellist has been in contact with me for a while and they’ve been great with performing my work. They did a fantastic job with “Elements of Metal” (http://www.metalsucks.net/2014/03/03/friction-quartet-oblivion/). Finally, will this recording be made available for sale at some point? Yes, on my TBD next album. I;m liking this one far more than the other one. The electric and classical pieces mesh really well, and the short film was surprisingly good. Interesting piece, both music and the film.